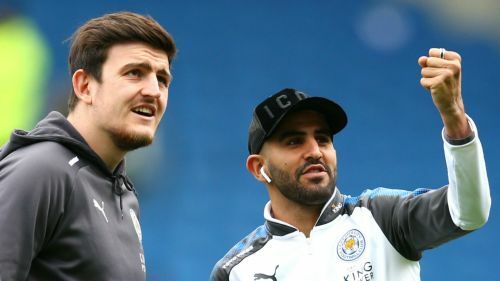 Riyad Mahrez risked the wrath of Leicester City supporters by suggesting England defender Harry Maguire deserves to play at a club higher up than Claude Puel's side. Algeria winger Mahrez became Manchester City's record signing when he joined from Leicester for a reported £60million and he used his first news conference at Etihad Stadium to encourage former team-mate Maguire to explore his options away from the Foxes. Maguire joined Leicester from Hull City in 2017 and made 38 league appearances for the club last season before becoming one of England's stars of the World Cup. Mahrez was asked whether he anticipated Maguire making such an impact on the world stage and he told reporters: "Of course. "I always believed that H was a very good player since the day he came to Leicester and the season he had last season. "It doesn't surprise me the level he was showing at the World Cup." Maguire scored in England's quarter-final victory over Sweden and emerged as one of Gareth Southgate's most reliable defenders as the Three Lions achieved their best performance at a World Cup since 1990. Mahrez suggested the 25-year-old could yet find himself playing at a bigger club than Leicester. He said: "Of course he deserves to play higher but Leicester is a good club as well so it is him that will have to decide."